1. Hamilton Square. There’s a lot to say here. First, the neutral segment. The website is up, www.southstreetproject.org. Plenty of renders (definitely not cookie-cutter), site plans, housing prices, everything one needs for a fair assessment. The units are no more than 2 floors, mostly townhouse format. 47 affordable rentals units, 11 affordable for-sale units, and 15 market-rate for-sale units for a total of 73 on a 19 acre site. That’s less than 4 units per acre (0.26 acres/unit, comparable to the older 0.25-0.5 acre lots on Pennsylvania and South Streets), and fits zoning. The units are interspersed throughout the property. Parking ratio is 2 spaces per units, units are a mix of 1-3 bedrooms. There will be aging-in-place and energy efficient home options for sale, as well as in the rentals. The project will host a playground and nursery/daycare facility geared towards low and moderate-income households. Much of this comes from the result of constructive community feedback. But what started off on a polite note is getting really ugly, really quickly. It is not a good sign when my editor calls me and tells me that, as a person of color, she felt uncomfortable at the latest meeting. Given the transparency of this process, which still hasn’t even been submitted for formal planning board review, I find comments about this being “hidden” or rushed through to be a stretch. The project hasn’t submitted anything for formal review yet. Nothing but a sketch plan has been done, and multiple community meetings, and 30-minute small group listening sessions. It really does not get much more personal than that. One of the questions that was raised was that people are unable there are many more affordable rentals than for-sale units. There are two reasons why that is. For one, funding for purchasable units is more difficult to get. The government is more likely to disburse a grant if it knows there are buyers waiting in the wings. That’s why the buildout for the for-sale units is 2-8 years. For two, for low and moderate-income households often don’t have much money saved for a big expense such as down-payment, and far more are capable of renting versus buying. There are valid concerns that need to be addressed. For example, traffic. A study is being conducted with a third party. The typical thing I hear, affordable housing, or any project really, is that “they’ll lie, they’re in XYZ’s pocket”. If no one trusts you to do your job properly, no municipal board will sign off on accepting your study, and you’re finished as a firm. Likewise with stormwater analysis and civil engineering. School system capacity is checked with the district, which basically just sends a letter saying “yes, we have room” or “no, we don’t have room”. The study is being conducted and will be made public long before any approvals are granted, people can weigh in after reading it to say whether it’s comprehensive and adequate, and feel free to say something and explain why it may not be. That’s the purpose of SEQR, to determine impacts and mitigate unavoidable impacts. On a related note, a board’s job is to review the objective components of a project. It is not appropriate, or legal, to decide on a subjective trait like whether the people who will live there fit the “Trumansburg way of life” or that the project is “too Ithacan”. Who decides what those things are? Because too quickly, it degenerates into a look or an image, and a train of thought that should never be a part of any development conversation. Because it’s subjective, those terms meant something quite different in 1997, and something quite different in 1977. Also, there seems to be this idea that poor people in urban neighborhoods will be forced out here, and they will be a burden on Trumansburg. There are plenty of people who live and work in Trumansburg who need affordable options in a rapidly-appreciating real estate market. The one bedrooms will be rented to individuals making $22k-$48k. That could be a store manager, a barista, a school teacher or a retiree. Tenants are screened, visited at their current home and interviewed before being offered a unit. Qualified affordable home buyers will mostly be in the $42k-$64k range (80-120% AMI). Think nurses, office workers, tradespeople (following INHS’s sales deeds, I actually see a lot of ICSD teachers). The market rate units will offer whatever the market allows price-wise; new townhouse-style housing in Trumansburg would likely fetch $250k+, so think upper-middle income. It would be nonsensical to make people in Ithaca move into housing in Trumansburg that they don’t want and would drive up their costs; however, those who want to live there, whether because they admire Trumansburg, work there, or both, will seek the opportunities it provides. For a county that seems keenly aware of its housing issues, there tends to be an uncomfortable amount of pushback against affordable housing, whether it be Fall Creek, South Hill, Lansing or Trumansburg. Does that qualify as being “too Ithacan”? 2. Taking a look at the county’s records this week, it looks like 210 Linden Avenue’s construction loan has been filed. Elmira Savings Bank is lending Visum Development (Todd Fox and associates) $3.15 million, with $2,358,783 towards the hard costs (materials/labor) of replacing the existing 12-bedroom student apartment house with a 9-unit, 36-bedroom apartment building. Elmira Savings Bank is one of the biggest single-family construction loan lenders in Tompkins, but they have only been the lender for a few multi-family projects. 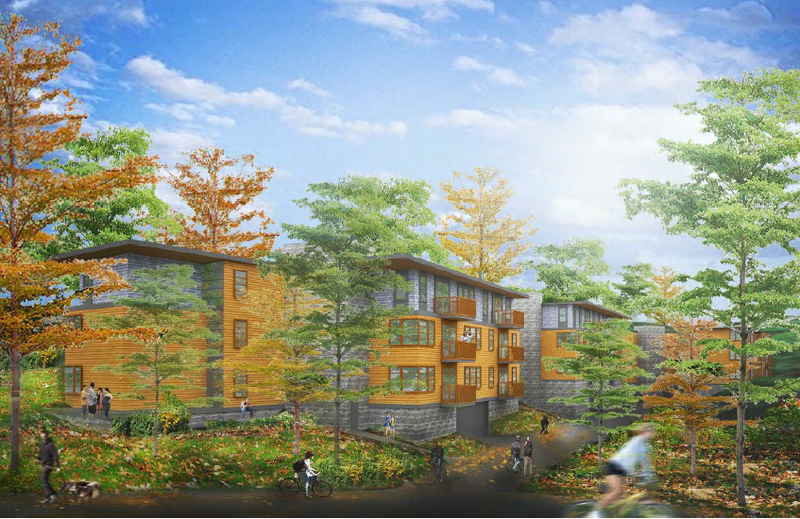 The only other multi-million project in the past few years was the 18-unit Rabco Apartments at 312 Thurston Avenue in Cornell Heights – a project that, along with the cancelled 1 Ridgewood, so incensed deep-pocketed permanent residents nearby that they petitioned and succeeded in getting the city to downgrade the zoning. Also filed this week was a $415,000 construction loan from Tompkins Trust to the owner of Hancock Plaza on the 300 Block of Third Street in Ithaca’s Northside neighborhood. The 19,584 SF shopping plaza, built in 1985, is assessed at $1.485 million and has been under its current ownership since 2002. Most might know it for the DMV, but it also hosts Istanbul restaurant, a bookkeeping service, and a gas station and convenience store that opened in renovated space in 2015. There’s no indication in the loan as to what kind of work will be performed, about $363,000 has been set aside for hard costs like materials and labor, and the work is required to be finished by March 2018. 3. Also filed in both sales and construction loans this week was paperwork for 306 North Cayuga Street, right next to DeWitt Park on the edge of Ithaca’s downtown. Also known as the C. R. Williams House, the 8,798 SF, ca. 1898 property was assessed at $900,000 and on the market for $1.4 million last year. The sale price was $1.3 million. I was privy to an email chain that engaged an out-of-state condo developer to look at the property, but that person was not the buyer. The LLC traces back to Travis Hyde Properties, just a few blocks away. According to Frost Travis of THP, the plan is to renovate the live/work space to allow for more space for THP, which is outgrowing its North Tioga Street location, and four apartment units. Exterior changes will only be cosmetic, but any substantial changes will be subject to ILPC approval, as the property sits in the DeWitt Park Historic District. Elmira Savings Bank is lending $1.24 million for the renovation, of which $1,204,752 is going towards the actual construction (so apparently, this was a big week for ESB). The project is expected to be complete by next summer, according to the loan filing. 4. For the aspiring homebuilder or developer – new to the market this week, a run-down though salvageable 1830 home at 1975 Dryden Road just east of Dryden village, and 101 acres of developable vacant land currently rented out for agricultural use. The sale price is $795,000. The county GIS lists the property at 112.4 acres, but without a map in the listing, it’s hard to tell if there’s a typo or if there might be a subdivision somewhere. The assessment is for $531,900, $401,300 of which is the land. It appears the property has been in the ownership of the same family since 1968. The property is listed as a rural agricultural district, which is geared towards ag uses, but permits office, one-family and two-family homes as-of-right; multi-family and box retail require special use permits. Zoning is one unit per two acres, but in the case of a conservation subdivision that preserves open/natural space, it’s one unit per acre – either way, only about 50 units allowed here. Technically, a PUD (aka DIY zoning) is also an option, but would need adequate justification. Kinda hoping it doesn’t become conventional suburban sprawl, but will reserve judgement for when this sells. 5. Ithaca is once again competing for $10 million in state funds as part of the regional Downtown Redevelopment Initiative. The funds are intended to spark investment in urban cores and improve infrastructure for communities throughout the state, ten cities selected each year, one in each region. Readers may recall Elmira won last year. This year, Ithaca is competing against two of its Southern Tier peers – Watkins Glen, with which it competing with last year as well, and Endicott, a struggling satellite city over by Binghamton, that is entering the competition for the first time. Reports suggest the Ithaca submission is largely the same as last year’s. Winners will be announced in the fall. Item #1 makes me feel sad and a bit nauseous. I thought that Trumansburg was a fairly welcoming community. I mean isn’t the Grassroots Festival going on now? Seems the Nimby mentality extends beyond the city of Ithaca. Too bad. I think it is reductive, divisive and counterproductive to characterize those of us who question/critique the proposed Hamilton Square development as NIMBY naysayers with unwelcoming sentiments. To the contrary, and as Ari Kissiloff has already quite eloquently expressed, dissent and questioning is the bedrock of building strong and inclusive community. There is clearly much to evaluate, analyze and confer on regarding the needs and impact of this nascient development of which so much has already been delineated in this listservs. I for one am in favor of developing affordable housing in Tburg, including the Hamilton Square development; it seems foolish to do so without acquiring as much information as possible to insure the best outcomes for our current and future community members. The filing on the plaza with the DMV/Istanbul restaurant is intriguing, but it sounds like it’s probably not enough money to be more than a cosmetic exterior facelift? Could something more substantial be built? That parking lot always seemed like a good site for something higher density to me. I need to swing by the Building Department. If there’s a loan filed, there’s a good chance the permit has been filed as well. They could do an addition without going to PB, so long as it’s all within zoning and doesn’t increase structure size by more than 50%. As for the Downtown Redevelopment Initiative, it must look a little silly for Ithaca to apply for subsidies again when projects like Harolds Square, Trebloc, or Tompkins Trust HQ that sought aid in the last application are proceeding on without those funds. Easy to see why Ithaca is losing out in these applications to needier upstate cities. I said something to that effect to Seph Murtagh and Ducson Nguyen when Elmira won last year. Other Southern Tier cities need the money much more than Ithaca does. They were sympathetic, but disagreed. The reporting on item #1 makes me feel sad and a bit nauseous too, but I was at the meeting, live in T-burg, and have looked into the issues and opinions. I don’t feel the article accurately represents the situation in many ways. Brian, we welcome you (and anyone else) to visit Trumansburg, talk to us, look into some of the Trumansburg housing and other community data. And yes, we’re welcoming the world to Grassroots!